Ryver supports the use of emoji throughout the app. You can react to messages, topic replies, tasks and comments. Look for the smiley face button on the pop-up hover toolbar, or “Add Reaction” in the ellipses menu. Reactions are a great way to “vote” on task cards in a task board when you are collaborating and deciding which tasks to prioritize. 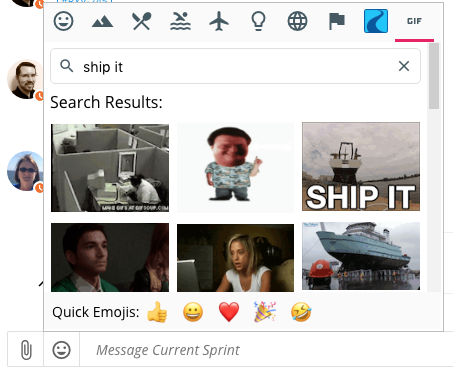 While typing a chat message, topic reply or task comment, you can type a colon and then start typing an emoji name and you will get an auto-complete pop-up to help you choose an emoji. Alternatively, just click on the emoji “smiley face” button next to the chat text box, popping up an emoji picker. In the emoji picker, you can select the last tab titled “GIF”, type a search phrase and then pick from 25 Animated GIFs!